TUG OF WAR IN THE OLYMPICS! As the start of London 2012 Olympic Games approaches, we look back at a time when tug of war was once a part of this global sporting showcase. Many people do not know that tug of war was once a part of the Olympic Games. It took place at five Olympic Games between 1900 and 1920. The modern revival of the ancient Greek Olympic Games became a reality in 1896 under the influence of Frenchman Baron Pierre de Coubertin. Tug of war first featured in the Olympic Games at the Paris Games of 1900. In its first two appearances at the Games, teams consisted of just 5 or 6 pulling members. In early Olympics, many teams consisted of athletes who were taking part in other events. 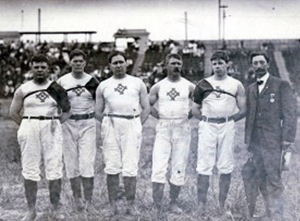 The 1900 Olympics saw the United States withdraw their team because three of their team were involved in the hammer throwing event. 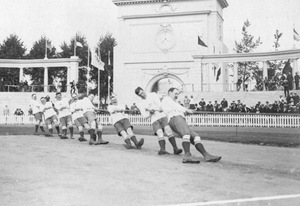 The first tug of war Olympic gold medal went to a combined team from Sweden and Denmark, after they defeated France in the final. The team of 6 from France included Constantin Henriquez de Zubiera who became the first black medallist in the history of the Olympic Games. He went on to win gold at a later Olympic Games with the French Rugby Union team. The outbreak of the first World War resulted in the non-staging of the Olympic Games in 1916. The Olympics were then held again in 1920 in Antwerp, Belgium. 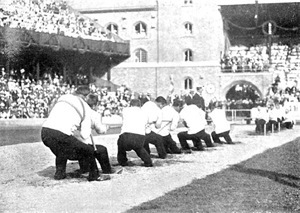 The City of London Police again represented Great Britain in the tug of war event, and after the disappointment of 1912, they bounced back to take the gold medal ahead of the Netherlands who won silver, and Belgium who won bronze. Photo: The Great Britain tug of war team of 1920 - winners of the last Olympic Gold Medal in Antwerp, 1920 - represented by the City of London Police. 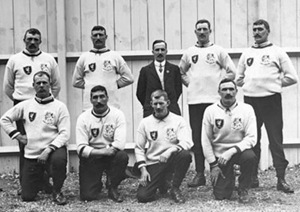 The City of London Police provided medal winning team members for the tug of war at three Olympic Games in 1908, 1912, and 1920. Three City of London Police Officers competed in those three games, winning 2 Olympic gold medals and 1 Olympic silver medal each. Those men were John Shepherd, Fred Humphreys and Edwin Mills. 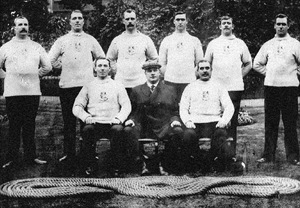 Fred Humphreys became the oldest man to win gold in the Olympic Tug of War event at the age of 42 at the 1920 Antwerp Games. Edwin Mills was also 42 at the 1920 Games but had a later birth date! 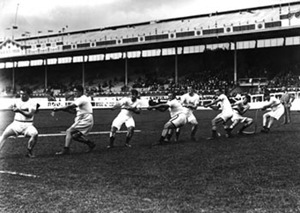 After the 1920 Games, Tug of War was removed from the Olympic Programme along with 33 other sports. During this time, the IOC decided their were too many sports and too many participants competing, so took the decision to remove a number of sports, and unfortunately, one of those was tug of war. Where did tug of war go after the Olympics? 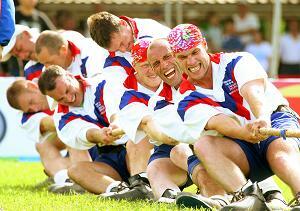 Since the 1920 Olympic Games, various countries set up their own tug of war associations. Tug of war in the UK was organised by the Amateur Athletic Association (AAAs) until 1958, when the Tug of War Association (England) was founded, followed by the foundation of tug of war associations in Scotland, Wales and Northern Ireland. The Tug of War International Federation (TWIF) was established in 1960 following a meeting between representatives of the Tug of War Association and the Swedish Tug of War Association in London. Since 1960, international championships have taken place annually at world and continental level, and TWIF now has in excess of 50 member countries worldwide. Tug of war is a recognised sport by the International Olympic Committee (IOC), and TWIF are currently focusing a lot of time and effort in getting the sport re-instated into the Olympic Programme. Tug of war is currently held at the World Games every four years, which is run under the patronage of the IOC for sports that are not yet part of the Olympic Games. Tug of War in the early Olympic Games were only held at Catchweight (no weight limit) for men’s teams. Modern day tug of war is now held in weight classes for both mens teams and ladies teams, as well as for junior and under 23 teams, and in recent years, mixed gender weight classes have been introduced, with teams consisting of an equal number of men and women. 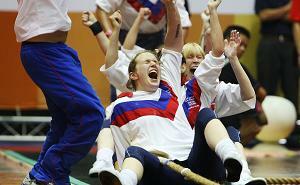 In addition, tug of war is also held indoor on mats, as well as outdoor on grass. The TOWA consider that tug of war certainly warrants re-introduction into the Olympic Games. The rules are easy to understand and the sport is spectator friendly. In addition, the results do not depend on subjective scoring by a panel of judges. Tug of war is accessible to everyone at all levels as the sport does not require large amounts of costly equipment, space, or bespoke sports stadia. “Faster – higher - stronger” is the Olympic Motto, and tug of war certainly fits the bill. The Tug of War Association remains hopeful that one day tug of war will take centre stage on the world’s largest sporting platform.